Due to the nature of magnetic signs they will only stick to ferrous metals (metals that contain iron) like steel. Most vehicles are made from steel however some are made from fiberglass, carbon fibre or aluminium. Before ordering magnetic signs it is important to ensure your vehicle has a steel body. The main advantage of magnetic signs is the ease in which they can be removed and re-applied. Magnetic door signs can be scaled to any size, please check your available space before ordering. Click the below options for more information and prices. Magnetic door (sheet) signs are made from a flexible magnetic rubber with the print applied to the non-contact side. 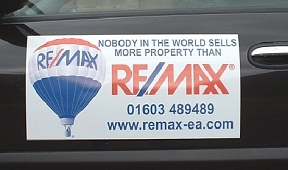 The whole reverse area of the door sign is magnetised, making a strong and safe vehicle approved product. When fitted correctly these magnetic signs will remain securely in place and have been successfully tested at speeds up to 70mph. Magnetic roof signs have large powerful magnets at the base of them to securely attach them to the vehicle, the vehicle roof is protected by a rubber boot that fits over the magnets. 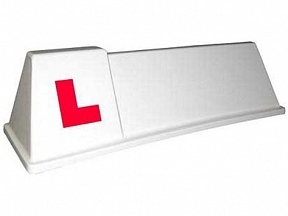 Magnetic roof signs are motorway approved and have been tested at speeds up to 70mph. Who can benefit from magnetic signs? Magnetic signs are often used as taxi door signs, driving instructor signs or magnetic van signs for contractors and tradesmen, basically anyone with any kind of business or service who needs to advertise on their car or van doors can make use of magnetic vehicle signs. The only consideration is the door must be steel (not fibreglass or aluminium), and always measure your available space before ordering magnetic car door signs. Magnetic signs must sit flat and not cover any trim. Magnetic signs can also be used on steel filing cabinets or steel control panels and engineering equipment. Magnetic roof signs are again most commonly used as taxi roof signs and school of motoring signs, but they can be used for any purpose where vehicle advertising is used. 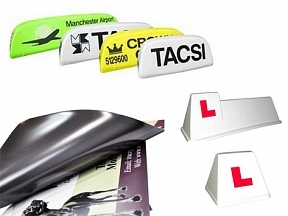 All magnetic vehicle signs are tested to 70mph to comply with vehicle usage. Magnetic signs are not permitted for use on bonnets for safety reasons.